Crawford’s starting position is that beginning in the Enlightenment there has been a push for the “individualism” as defined by Kant’s “rational human”, and “freedom” from the monarchy, the government, any outside influence in fact. The author’s argument is that this mode of thinking is both anachronistic and detrimental the modern world in which we find ourselves situated. We are finding ourselves more ostracized from both our communities and from the physical world. At the same time, we’re expected to be hyper-responsible for our individual decisions as defined in a Libertarian political philosophy. Given this position of “rational human” we’re left to make decisions in a sort of vacuum, separated from both culture and context. This leaves our lives (private and public) open to choice architects and consumer capitalism. Choice architects create experiences to fill the void left when we have no opinion, or choose not to directly engage the physical world. No one explicitly argued we should not have advertisements in the bottom of luggage trays when going through security at the airport. I think this is commonly called the reduction of “the commons”. Public space is becoming more saturated by choice architects whose interests align with corporate entities, not the public. After reading Hooked (Nir Eyal) about the design of addictive products, this is the disruptive world of technology we live in. It has been said that we didn’t get flying cars to take us through a physical space, we got the instantaneous variability of a Twitter or Instagram feed that satisfies deeply psychological appetites. The author makes the distinction between a tool using human – the hockey player whose stick becomes an extension of his body or the motorcyclist who can feel the variations of traction, gravity and … vs. a person playing a video game who is learning only to press a button to get the exact same response/reaction. The direct feedback provides no context between the action and response. We understand the world around us by interacting with it – it informs our reality. The real world is our best model says the author. The most extreme example in the book is of gamblers playing electronic slot machines and the evolution of the gambling industry. These games are purposefully designed to drive players to ‘play to extinction’, effectively using gamblers as a financial resource to extract money and then discard. The games are designed for addiction. The author is addresses how deeply we hold on to our beliefs and succumb to our cognitive biases. It takes real work to first step outside of our perspective to see a new perspective, and even greater effort to then engage with another person in conversation to reach a shared understanding. David Foster Wallace speaks about this problem in his commencement speech at Kenyon College in 2005. Crawford argues it’s not enough to simply have empathy for our co-passengers but to actively begin a conversation and attempt to reach a shared understanding. 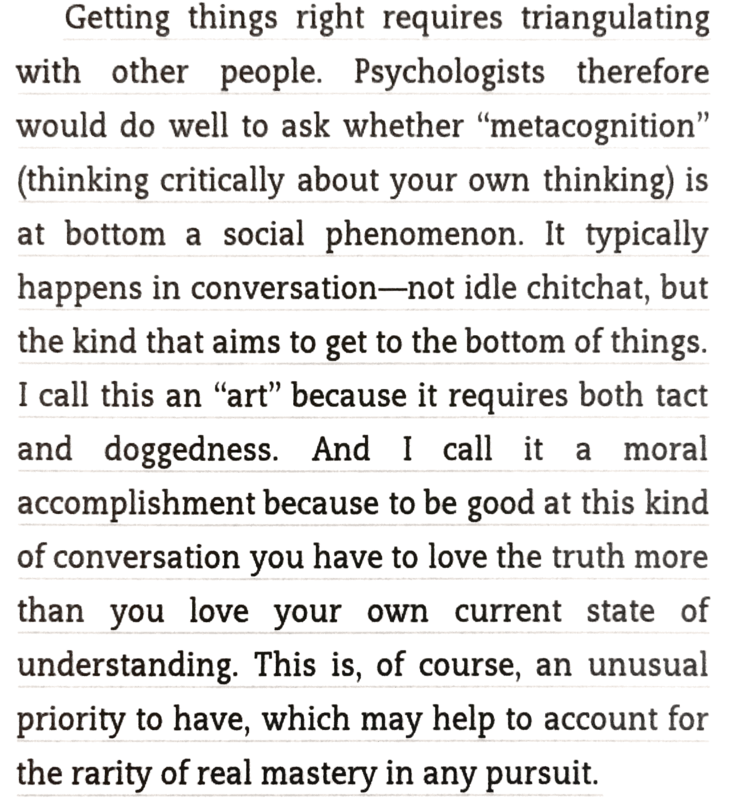 I’ve always thought that speech was the pinnacle of DFW’s philosophy, and had never read a counter-argument until now. There are types of interactions that foster this communication, Crawford uses examples from highly skilled physical work to highlight both the attentional focus and the conversation that occurs when communities of individuals are highly skilled and focused on a shared task. He uses as an example the distinction between learning in a vacuum, explicit book knowledge for example, and the tacit learning that comes about from an apprenticeship model. Interestingly in technology circles (and software product design), we talk about this idea of magic. “If the product could do anything, even something magical, what would it do?” I’ve posed this question numerous times in design research sessions. The goal is to find out what the customer considers a magical feature and then work backwards to the possible and begin to shape the product that will be designed. 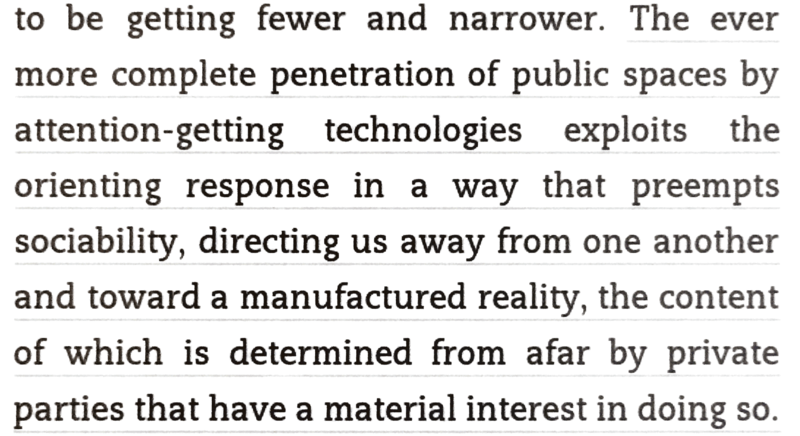 What Crawford is highlighting here is the lack of grounding with the physical world we inhabit with the technology that is becoming ubiquitous. The separation of direction action (agency) from the system response from a click. His argument is that we’re losing our sense-making abilities. An example he provides is of a motorcycle racer feeling the way the machine is interfacing with the road through sight, feel, sound and the lack of sensory insight (the obfuscation of) sensory input in something like electronic braking in a car. We are putting software interfaces between our physical senses and the natural world. Is introducing magic (through technology) in our day to day lives a good thing? Where do we begin to separate from direct manipulation of the physical world. Virtual Reality is a good example here. The Handy Dandy machine Crawford uses as an example is a Disney invention in current Disney clubhouse cartoons. He’s making the distinction from the physical comedy of old cartoons (where Mickey was beset upon by flying brooms, cast iron pans, etc and the new cartoons where kids are prompted to make a magical choice not grounded in any physical reality). The choice architects have limited what is the possible. There is a passive interaction going on here – our frustration with reality rises and we sink into the instantaneous feedback loops of digital products. This is the ubiquitous world of computing we’re inhabiting today. Any piece of knowledge in the world at our fingertips (or ears via a personal assistant like Alexa, Siri or Google Home). There seems to be a “compression” occurring – we are more able to locate and recall information thus expanding our capacity, but we’re losing the context of why the information is important in the world. We can escape from the physical world into the information space that’s all around us. Crawford describes this arrangement as a new form of autism. People disengaging with the physical world and retreating to information spaces. Reading this book following Hooked (and being a professional designer) really drives home the questions of ethics of product design (and experience design). What are we actually designing? To what end? 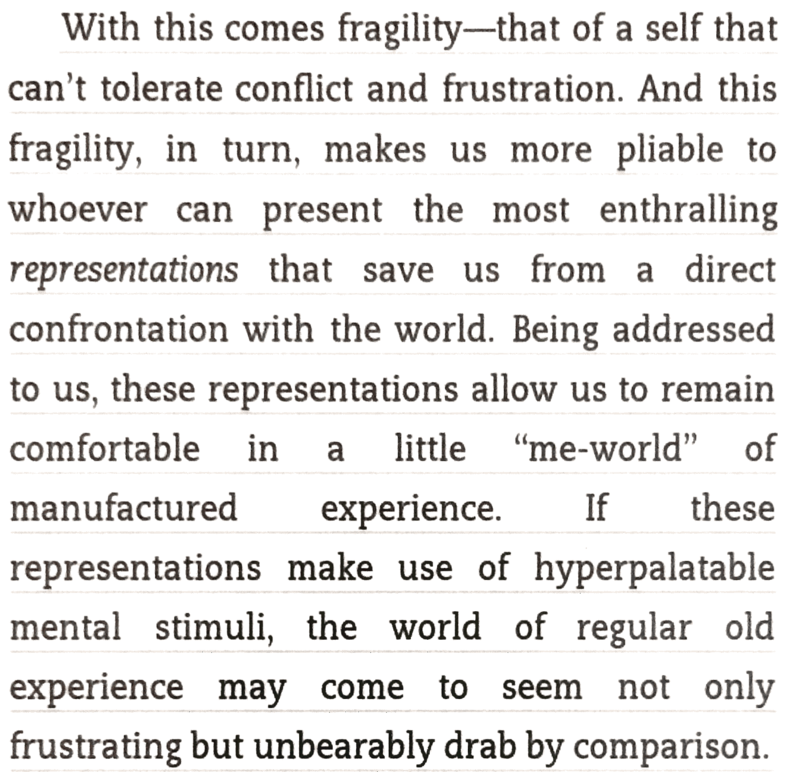 What is the value of an experience in the real world? What is the value of mastering a skill that doesn’t involve the ability to click a button or manipulate a digital interface? Ultimately the author presents the concept of “ecologies of attention”. Shared experiences of skilled practitioners creating value tied directly to the physical world. In order to take back our attention, we need to create ‘ecologies of attention’ that provide direct feedback to the physical, not the virtual world. I love the idea, but it feels like the train has already left the station. So where do we go from here? In the design of software products, I think a balance can be found in providing information and designing interactions that ground the user in the concrete. The concrete being a relatable context the user can comprehend. Finally, it’s helpful to understand the lineage of philosophy, economics and technology from the Enlightenment to the present in order to better understand why it feels so unnatural to immerse ourselves in technology and to better establish a position for how to think about how we think (meta cognition) about ourselves in the technology revolution in which we find ourselves. More could be said about the value of a liberal arts education or the value of mastering a skill… but I’ll stop here.